80 km/h (50 mph) ? The Grey Line (Vatcharapol - Lat Phrao - Rama IV - Rama IX Bridge) is a planned monorail line in Bangkok, Thailand. As of 2016, construction has not yet started. Its path runs along a north - south axis. The line would support the growth of residential areas around Pradit Manutham Rd. and the Sathupradit area in Yan Nawa District. The route runs from Ram Indra Road, on the northeast outskirts of Bangkok, down south through Pradit Manuthum Rd. along the Chalongrat Expressway going into the downtown district of Thong Lo. From there, it passes through Sukhumvit Rd., Rama IV Rd., and Ratchadaphisek - Rama 3 Rd. It ends at The Rama IX Bridge in the south of the downtown Bangkok. The total distance of the route is approximately 26 km and is expected to service 340,000 passengers per day. The new Yingluck Shinawatra led government, who replaced the Abhisit Vejjajiva led government, decided to defer plans to continue the Grey Line and the Light Blue Line, citing that the lines are not a priority within their current 10 lines Master plan. 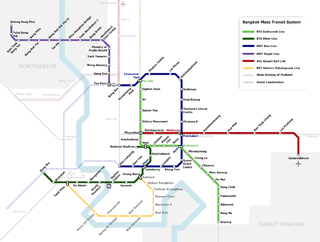 If the Bangkok Metropolitan Administration plans to pursue construction, the BMA must fully fund the line itself. The BMA stated in mid 2013 that it considers the Grey monorail line a priority and planned to progress planning by completing an EIA by the end of 2013 for the line to be tendered by early 2014. If approved, construction would take place from 2015 - 2017 for opening in 2018. However in March 2014, the OTP stated that they would contract a consultant to undertake further study of the Grey Line. In May 2014, a consultant was contracted to undertake a financial feasibility study of the line which is expected to complete its work by the end of 2014. A second public hearing was held in January 2015. An environmental impact assessment was completed in September 2016. The BMA is also considering a possible Phase 2 extension along the length of Rama 3 rd, over the Chao Phraya river and along Ratchadapisek rd (Inner Ring rd) to Tha Phra to replace the BRT along this route. This would enable the Grey Line to interchange with the BTS Silom Line at Talat Phlu station, the future MRT Purple Line (Phase 2) southern extension and link with the MRT Blue Line extension at Tha Phra station. The route has a total of 21 planned stations. Transfers to BTS Sukhumvit Line at Thong Lo Station. ↑ "BMA holds public hearing on Grey Line monorail project". thainews.prd.go.th. Retrieved 2016-10-30. ↑ PCL., Post Publishing. "Bangkok Post". www.bangkokpost.com. Retrieved 2016-10-30.